Mix together ingredients for the cajun seasoning. Rub chicken in arrowroot and a pinch of pepper. Set a nonstick skillet on medium-high heat. Once hot, spray it with olive oil then add the chicken breast pieces. Sear on the outside for about 3 minutes, or until you get a light sear on the chicken. Remove the chicken from the skillet and no worries if there are still pieces that are undercooked. Reduce the heat to medium, then add olive oil, garlic, onion, bell pepper and celery. Cook for 3 minutes, until onions begin to turn brown and translucent. Add the cajun seasoning and “bloom” the spices with oil and onion mix. Then add chicken stock, tomato paste and seared chicken breasts. Stir everything together and bring to a light simmer. Add in the bay leaves, then cover and cook on low heat for 15 to 20 minutes. 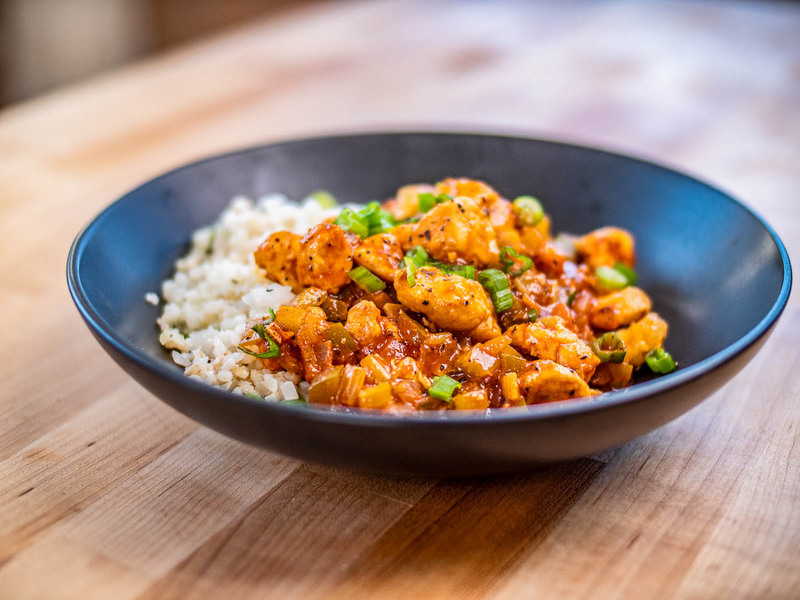 While the etouffee is finishing, mix together cooked steamed cauliflower rice with cooked brown rice, then add a pinch of black pepper and green onion for added flavor. Remove the skillet from the heat, stir and season to taste with sea salt & pepper. Allow it to slightly cool to thicken and enjoy.